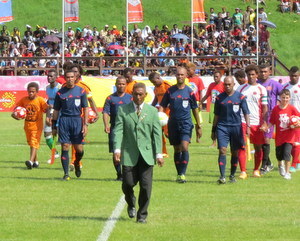 The Solomon Islands Football Federation (SIFF) Competitions Department made the announcement following confusion about the closing date for applications amongst clubs who want to apply. It is hoped that with this announcement will clarify the air surrounding the matter. Joseph Boso, head of the SIFF Media and Competitions Department, called on clubs to finalise their applications and ensure that the deadline is met. “We ask clubs to complete this important process so the next step can be started – there will be no extensions. The S-League Board will meet to consider the applications and announcement the new franchise clubs for the next two seasons,” Boso says. In the last licensing period nine clubs were issued licenses after the S-League Board decided to increase the number of competitors. The S-League commenced in 2011 with only eight clubs in the competition – whether there will be a return to this number is unclear at this stage. Boso explains that it is the S-League Board who will sit down and make considerations concerning the number of licenses based on the minimum and maximum set by SIFF. “As before, the S-League Board is the body appointed to make decisions concerning this competition. They will meet and they will decide if there will be the same number of clubs or less,” Boso says. What is confirmed is that the legal landscape within which the S-League will operate will be stricter following a move by FIFA to professionalise club competitions throughout the world. This was communicated to SIFF and local clubs via a meeting with James Johnson, from the FIFA Legal Division, which discussed club licensing and its implications for Solomon Islands. Under clubs licencing national leagues will be required to comply and conform to FIFA competition standards. This may mean that the S-League could be amended to include promotion and relegation to remain a FIFA sanctioned competition. Clubs will also have to meet stringent requirements and must operate as professional institutions. Clubs may be legally required to own training grounds, run youth programmes, operate women’s teams and appoint full time managers. Boso says that many of the requirements have already been incorporated in the current licensing framework of the S-League but the difference will be enforcement. “SIFF pioneered with the S-League, a licencing framework for clubs aimed at boosting professionalism but this was difficult to apply because we were alone. With FIFA’s new proactive stance, the enforcement will be applied locally, regionally and internationally,” Boso says. Meanwhile, the current members of the S-League Board has seen their term extended by two years by the new Solomon Islands Football Federation (SIFF) Executive Committee in its meeting earlier this month. The current board was appointed in 2013 by the former SIFF executive committee.